The secret's in the removable pack: heat it, put it in the pouch with your bread, and wrap it up. The best thing to happen for sliced bread, this blanket keeps your favorite loaf warm and fresh for much longer than the traditional napkin. The secret is in the removable flax seed-filled pack: heat it in the microwave, place it in the blanket's pouch with your bread, and wrap it all up. Choose between a basket pattern or classic white for a charming addition to your own table or a unique hostess gift that lets "fresh out of the oven" last all dinner long. Made in Brooklyn, New York. Also check out our Baked Goods Warming Box. blanket: 28" sq. ; flax seed pillow: 9" sq. Blanket: machine wash cold; tumble dry low. Flax seed pillow: spot clean. Microwave flax seed pillow for 1 minute increments as needed. Removable flax seed pillow is microwave safe, do not microwave exterior blanket. Wrapping bread in a cloth napkin in a bowl wasn't working so well. This wrap keeps the bread warm through dinner. Best gift for my mother in law! Fabric is heavy duty and construction is quality. 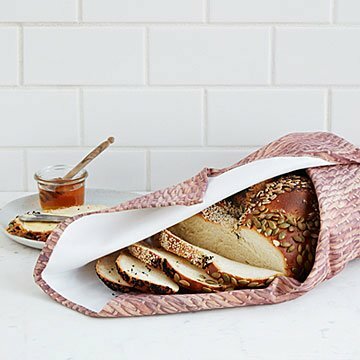 We havent used it and almost didn't want to because this bread blanket is just so beautiful. Easy to use and good quality! A unique gift well received! Looks like this will help my daughter-in-law's homemade bread and rolls travel well! Please, do not buy this gift. I found item heavy and awkward. Great idea, but heavy and not especially attractive. We may even order another one!